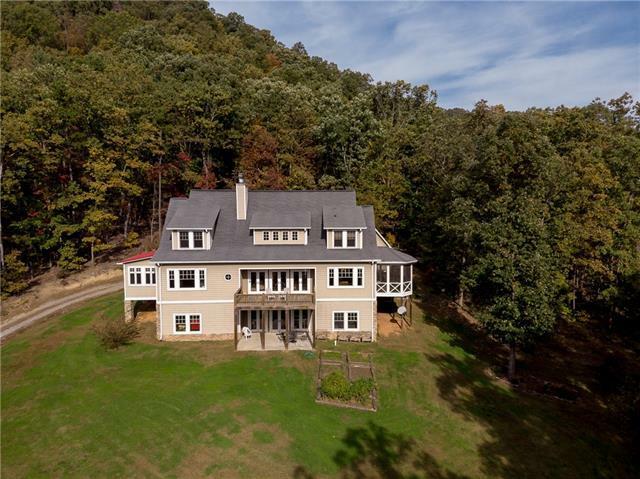 Beautifully designed, custom built home in the Foothills of NC. This home sits on 26 acres with a large 3 car detached garage and loft convenient to the homes entrance. A short walk away in the lower fenced pasture is a very spacious, well-built, Lester brand horse barn with 3 beautifully appointed stalls, a nice working hallway in the center and a large section of working space with concrete floors making a nice wash down and storage area. This 3 bedroom with 3.5 bath floor plan is one of Southern Livings most popular designs called "Chestnut Hill. It is a great spacious layout where the master suite with sunroom, great room, powder room, kitchen with screen room, dining, office niche, and laundry are all located on the main entry level. The upper level features a den overlooking the great room with a bedroom, closets and bath on either side. The home also has a large open unfinished basement that is pre-plumbed and can be finished into additional living space!